Amid Blackouts, Venezuela's Maduro Announces Electricity Rationing The president pleaded with the public to remain calm and resist violence as the country's top "specialists, scientists and hackers" work to put an end to power, water and communications blackouts. A woman holds a placard reading "We Want Water and Electricity" as she shouts slogans during a protest in Caracas, Venezuela, about a lack of water and electric service during a new power outage in the country on Sunday. President Nicolás Maduro announced a 30-day electricity rationing plan to help as the government works to restore service. "I have approved a 30-day plan to regulate the [electricity] output," Maduro said in a televised address, explaining it will help curb the outages that have recently thrown the country into chaos for days at a time. The announcement came on the heels of a fourth major power outage in the month of March that left Caracas and other major Venezuelan cities paralyzed without electricity, water or communications services. Maduro blamed the Trump administration for orchestrating a series of attacks, saying the center of the electrical system was "penetrated by a virus and hacked by the North." Without providing evidence, he said the attacks originated in Houston and Chicago and that Friday evening's blackout was caused by an "electromagnetic attack." He alleged the U.S. had instigated the electricity war on Venezuela "to drive people crazy" and manipulate them into tearing apart the country. "We are confronting monsters who want to destroy Venezuela," he said. He urged people not to take to the streets or participate in guarimbas, setting up blockades, setting things on fire or throwing rocks at police. "Say no to guarimba! Say no to fires! Say no to violence!" he exclaimed. Maduro's speech came hours after scattered protests had already erupted in neighborhoods around the capital and near the presidential palace in Miraflores — a result of a call to action by opposition leader Juan Guaidó, who had urged demonstrations against the "usurper regime." "There is no sabotage," and there is "no such rationing," Guaidó said in a pair of tweets, adding that the power blackouts have been triggered by outmoded infrastructure and poor upkeep due to the government's corruption and neglect. Pueblo de Venezuela: no existe tal racionamiento. Guaidó also wrote that anti-Maduro leaders had spoken with Colombia and Brazil to import electric power while the government grapples with the crisis. Guaidó has been recognized by the U.S. and about 50 other countries as the legitimate head of state after Maduro won a second term in an election that many international leaders assert was rigged. "No one can put up with this. 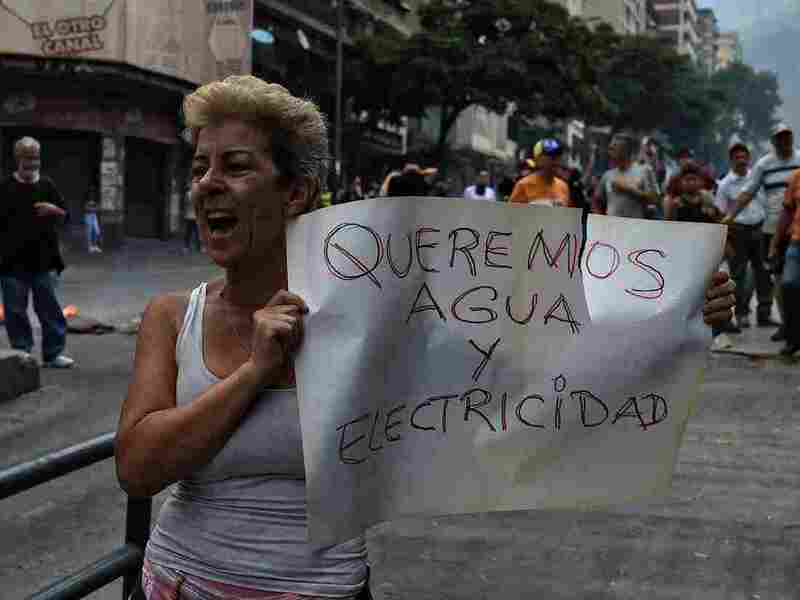 We spend almost all day without electricity," Karina Camacho, a 56-year-old housewife, told the Associated Press. She was unable to buy a chicken when electronic payment machines stopped working for the third consecutive day on Sunday. "There's been no water since [March 25], you can't call by phone, we can't pay with cards or even eat." Venezuelan reporter Gabriela Gonzalez interviewed a frustrated woman responding to Maduro's calls for patience. "How can I have patience?" she asked in a Twitter interview. "It's not possible because ... he has stolen everything that's beautiful about Venezuela ... including robbing the children of Venezuela of their futures — the right to education, to food" and to basic necessities, she said. As people protested down the streets of Caracas, shouting anti-Maduro slogans and banging on pots and pans, some were met by armed paramilitary troops called colectivos, El Nacional reported. Images posted to Twitter show men, dressed in civilian clothes, carrying handguns and what appear to be rifles. In one video posted to Twitter by Kelvis larez, people can be seen running down a street as nearly two dozen gunshots are fired within 30 seconds. It is unclear who was firing the weapons or if anyone was killed or injured. But according to El Nacional, two people on the same street suffered bullet wounds. Maduro encouraged all "revolutionary and patriotic" members of colectivos across the country "to defend the peace of every barrio, of every block." "They will not take away our peace," Maduro vowed.